WASHINGTON—Chastising the assembled reporters for failing to cover the story, press secretary Sarah Huckabee Sanders repeatedly insisted Wednesday that President Trump’s footprints created the Great Lakes. 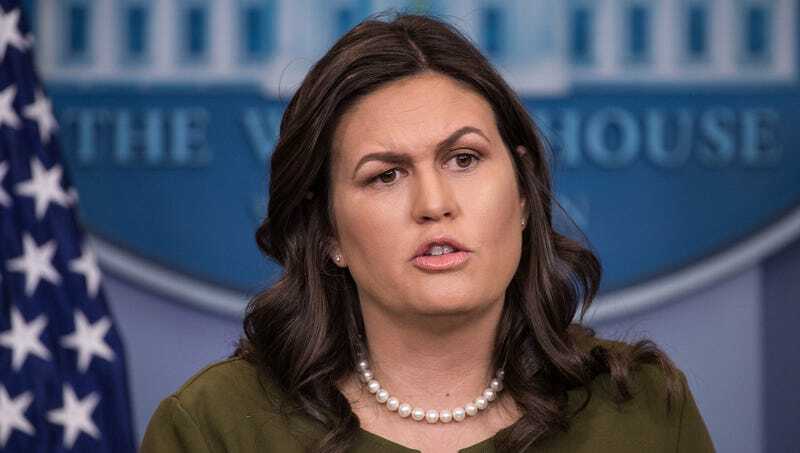 “In its relentless effort to undermine this administration, the media has completely ignored the fact that Lake Huron and Lake Ontario were formed when the gigantic, thundering footfalls of the president made impressions in the ground during a stroll along the U.S.-Canada border,” said Huckabee Sanders, adding that media outlets had willfully chosen not to acknowledge that the enormousness of Lake Superior was due to the president jumping up as high as the moon and landing on the earth with all his might. “Frankly, it’s disgusting that journalists are obsessed with the president’s health when they should know full well that when he was five years old, he was already so big that he had to use a wagon wheel as a coat button and so strong that he could clear a whole pond of bullfrogs with one holler.” At press time, however, Huckabee Sanders had amended her remarks, noting that Fox News had indeed reported that the president’s frustration with Democrats had led him to shed the massive teardrops that formed the Mississippi River.